Essay from the year 2010 in the subject Art - Art Theory, General, grade: 8,5, University of Amsterdam (Cultural Analysis), course: Art as an Institute and its Critique, language: English, comment: Note entsprich etwa einer 1,5 in Deutschland. Cultural Analysis: Exchange student from University of Arts and Design, Karlsruhe, abstract: 1.Introduction The avant-garde intends the abolition of autonomous art by which it means that art is to be integrated into the praxis of life. At least this is what Peter Burger states in his groundbreaking book Theory of the Avant-garde. In the book Burger gives some examples that shall acknowledge and prove his theory, e.g. Rene Magritte or Marcel Duchamp. It is clear that such examples need to stay eclectic in order to fit the developed theory. In the following Burger's text will be put to the acid test by analysing some avant-garde works through the eyes of Peter Burger, and it shall be examined if specific, programmatic avant-gardist works go well with his theory. The manifestos by the (first) Dadaists in Zurich seem to be extremely useful for this attempt. Their "productions" haven't been canonised yet and have served as an example for further Dadaistic productions in Germany, the USA, the Netherlands, Romania, Georgia, Poland etc. They (excessively) produced manifestos and declared their ideals and plans. However, these declarations always remain a bit opaque as they avoid clear statements and explicitly write absurd. In their works the Dadas often make statements and shortly afterwards reject them again. Tristan Tzara's manifestos are great examples of this kind of text, therefore this paper focuses on his writings but will consider manifestos by Walter Serner, thoughts by Marcel Janco or Hugo Ball as well. 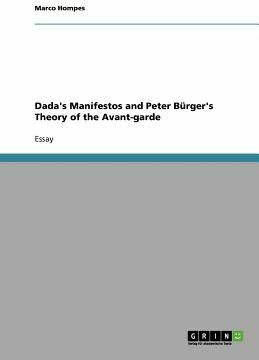 Can Theory of the Avant-garde be a key to excerpt meaning from the Dadaistic text production, or do the manifestos go beyond Burger's theory, or even prove him wrong?